If you own or run a farm, you know what it means to work with animals. As much as we love the furry creatures- and love to eat their bi-products- they can be dirty! But aside from the mess animals make, there is something far worse to be afraid of- disease. Owning a pressure washer, and using it frequently is one way to protect yourself, your workers, your animals and those who visit or purchase your products. When working with food, sanitizing is everything. You can use a pressure washer to clean and sanitize pens, machinery and other farm equipment. Performing this task will promote healthy animals, as well as prevent the spread of disease. In fact, many municipalities in the US, UK and Canada require certain used equipment to be pressure washed before use. The largest agriculture users of the pressure washers are the pork producers. There are two types of operation in pork production, farrowing and finishing. In the first phase, coated steel or concrete farrowing crates are made for pigs to deliver their young. The small pigs stay there until they are big and old enough to be taken out. During this period their living area will became a real mess with several layers of build up of manure. Once they are taken to second phase- finishing, furrows need to be cleaned. 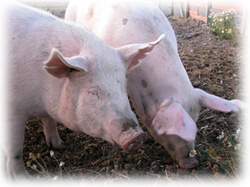 Due to the small pigs susceptibility to disease, the regulation mandates the disinfections of these areas and surfaces. Since these are usually mass production facilities, we recommend a 3000 PSI hot water pressure washers. Not only their pressure will remove the dirt and droppings, but it will also disinfect the farrowing crates. The machines need to be equipped with the downstream chemical injector for cleaning solution application. On the other hand, in finishing phase, either cold or hot water can be used. Regardless of the temperature, high pressure and high water volume must be applied. We highly recommend a machine of 4000 PSI or higher and 4 gallons per minute or higher. Rotating nozzle is also recommended because it will allow the user to clean faster by 30% or more. Double check the type of surface you are pressure washing since only concrete floors can withstand that kind of pressure. In case you have a softer floor, use a unit with 3000 PSI and 5 GPM or more. In that case do not use the rotating (turbo) nozzle. You should start by clearing the pens of animals, feed, hay and anything else that could get washed away. Next, you pre-treat the area with detergents safe for the animals. Leave that on floor about a half-hour. Next, you pressure wash from the top down, paying attention to corners and crevices, as every nook and cranny should be cleaned. You may have to scrub anything that is caked on. Next, the pen is rinsed and let dry. After it is dry, it can be disinfected. On farm equipment, a pressure washer with at least a 3000-PSI is recommended. The high pressure washers will allow fast and easy dirt removal. Chemical injection power machine should be used since the cleaning solutions are the ones who will soften the grease and let the pressure washer wash it away. When you are applying chemical spray from the bottom and work towards the top of the equipment you are cleaning. When rinsing start at the top and work your way downwards. Use extra caution when power washing around the bearings. High pressure could potentially force water into the bearing assembly and cause rust and premature bearing failure. Use 45???? nozzles when working around the engine compartment to avoid possible damage. Never use the rotating nozzle when washing your equipment. It will dent and scar the surface. So whether you have cattle or dairy cows, or chicken or turkey, a pressure washer is definitely a solution on your farm for maximizing safety of all.